[S207] Church books for Silte parish, Kyrkoböcker 1838-1861. [S10] Obituary of Johanna Hanson. [S37] Grave marker, Holbrook Cemetery, Holbrook, Furnas County, Nebraska. 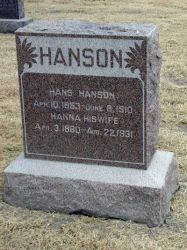 [S16] 1900 US Census - Household of Hans Hanson. [S95] 1910 US Census - Household of Hans Hanson. 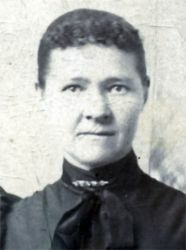 [S132] 1920 US Census - Household of Hanna Hansen [Hanson]. [S112] 1930 US Census - Household of [Anna] Hanson. [S128] 1890 Swedish Census - Household of Johanna Katharina Kristina Hansson. [S204] Church books for Silte parish, Kyrkoböcker 1877-1894. [S204] Church books for Silte parish, Kyrkoböcker 1877-1894, Lysnings och Vigsel Bok.